Console tools are available through both the Tools menu (A) and the Toolbox (B). To enable the Toolbox, click View > Toolbox. To save space in the console, however, you may choose not to enable the Toolbox, and just select tools from the Tools menu. 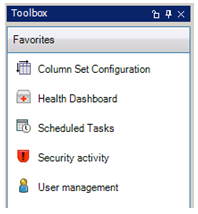 Endpoint Manager administrator sees all of the tools in both the Tools menu and the Toolbox. Other Endpoint Manager users will see only the tools and features that are allowed by their assigned rights. Tools dependent on rights that a user hasn't been granted don't appear in the Tools menu or in the Toolbox when that user is logged in to the console. For example, if a user doesn't have the "Power management" right, the Power management tool does not appear in either the Tools menu or the Toolbox. When you click a tool name, the tool's window opens in the console, below the Network View. Tool windows can be resized, docked, floating, hidden, and closed. You can have multiple tool windows open at the same time, docked or floating. For more information, see Move and resize tool windows. If you find you use certain tools more often than others, you can quickly set up a Favorites toolbox by right-clicking any tool in the toolbox and selecting "Show in Favorites". You can then access your Favorites from the Favorites button in the bottom of the Toolbox panel.